a computational resource to offload some of their heavy computation. On March 15, 2014 I presented RoboEarth at the TEDxYouth conference at Adliswil, Switzerland. The talk discussed about the three main elements that are required to build an internet for robots (language, storage, and computation) and showcased RoboEarth's contributions towards these elements. After four years of research, we will be showcasing RoboEarth through a demonstrator that includes four robots collaboratively working together to help patients in a hospital. These robots will use RoboEarth as a knowledge base, communication medium, and computational resource to offload some of their heavy computation. Do not miss this great event! For a detailed information on the schedule and the location click here. RoboEarth is co-organizing a Special Issue on Cloud Robotics and Automation in the Journal IEEE Transactions on Automation Science and Engineering (T-ASE). 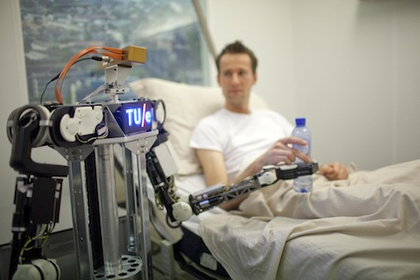 For more information, have a look at the Cloud Robotics and Automation Call for Papers on the T-ASE website. In the video above, ETH Zurich's Master student Vladyslav Usenko shows how the RoboEarth Cloud Engine (nickname: Rapyuta) enables a basic, low-cost robot like the iRobot CREATE to perform full 3D mapping in real-time. For details on the setup and how it works, have a look at an in-depth article about robot mapping in the cloud on Robohub. The RoboEarth team organized a Cloud Robotics Workshop at the eu Robotics Forum, 19-21 March, Lyon, France. The event was very well received. Note: Echo is gone after the first 2min. You may also want to have a look at the archived Cloud Robotics workshop page. It is our pleasure to announce the first public release of Rapyuta: The RoboEarth Cloud Engine. Rapyuta is an open source cloud robotics platform for robots. It implements a Platform-as-a-Service (PaaS) framework designed specifically for robotics applications. Rapyuta helps robots to offload heavy computation by providing secured customizable computing environments in the cloud. Robots can start their own computational environment, launch any computational node uploaded by the developer, and communicate with the launched nodes using the WebSockets protocol. 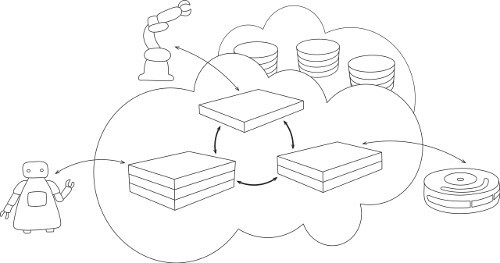 The above figure shows a simplified overview of the Rapyuta framework: Each robot connected to Rapyuta has a secured computing environment (rectangular boxes) giving them the ability to move their heavy computation into the cloud. Computing environments have a high bandwidth connection to the RoboEarth knowledge repository (stacked circular disks). This allows robots to process data directly inside the computational environment in the cloud without the need for downloading and local processing. Furthermore, computing environments are tightly interconnected with each other. This paves the way for the deployment of robotic teams. The name Rapyuta is inspired from the movie Tenku no Shiro Rapyuta (English title: Castle in the Sky) by Hayao Miyazaki, where Rapyuta is the castle in the sky inhabited by robots. To learn more and contribute to this open-source effort, visit: http://rapyuta.org/. At this year's PICNIC Festival in Amsterdam, RoboEarth held a joint workshop on Robots and the Internet of Things (IoT) with Council, a think tank part of the High Level Expert Group (EG IoT) on the Internet of Things of the European Commission. The event met with unexpectedly high attendance, resulting in a room packed with an interested and engaged audience and resulting in lively discussion and debate. The main topics centered on how robots could enrich our lives through the Internet and the challenges both communities face to make a vision where the Internet gets hands through robots, and robots greatly benefit from the Internet become a reality. As the chairman Rob van Kranenburg introduced: "Rather than programming robots to handle every potential situation, the Internet of Things could create an environment in which the objects themselves inform robots of their purpose and usage. Tomorrow's smart objects can provide sensing, robots can act, processing can be on the robot or in the Cloud. To accomplish this, the fields of robotics and IoT need to define common standards for knowledge storage, representation and communication." Rather than programming robots to handle every potential situation, the Internet of Things could create an environment in which the objects themselves inform robots of their purpose and usage. Both the IoT and RoboEarth encode knowledge. The fields of robotics and IoT need to define common standards for knowledge storage and representation. The IoT, robots, and humans need to communicate. The fields of robotics and IoT need to define interfaces and common standards for communication. For more information, have a look at the article Enlisting Robots - Once robots are integrated into the Internet of Things, they can perform tasks automatically published in the RFID Journal. Even more information can be found in the article The Internet of Things: Robots, RFID & Co-operation published in the December 2012 issue of Elektor. The RoboEarth project's second annual Industrial Advisory Committee (IAC) meeting was held at the Technical University of Munich, Germany, on May 23rd, 2012. This second meeting focused on getting feedback on the project's direction at its half-way point. Thanks to all participants, in particular to the members of the committee for their participation and valueable feedback.